This is significant issue for disaster management. Disaster Reduction Education for students is one of solutions. Education can let students take measures not only now but also in the future. The main objective of international exchange learning is the understanding of different culture. Therefore, many people have thought that international exchange learning is just to show culture to each other. But the important objective of international exchange is raise awareness that human beings is one of global citizen through understanding different culture and people in different area. Globalization is going off. Many problems can not be solved domestically. So people who have much internationalism are needed. International exchange learning is important for it. 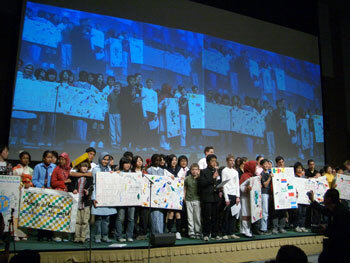 In March 2005, “NDYS 2005 in Hyogo” international meeting was held as the final phase of NDYS 2005 and 60 students from 12 counties participated in it. In the presentation of declaration statement, students from Ache, Indonesia show the presentation about Sumatra earthquake which occurred in December 2004. Audience watched it seriously and had serious condolences for students’ feeling. Students made declaration statement which showed “Regarding today, March 28th as the starting point to consider disaster, we will continue working on the study with the words, ”Try to feel, try to learn, try to share” in our mind.”. They try to continue to take action in activities in various area and disaster relief activities with cooperation through exchanging information making use of ICT. Understanding their thought, NDYS 2006 will start in September 2005 and the final meeting will be held in January 2006 that the Great Hanshin-Awaji Earthquake occurred in the month. Schools can participate every year but students can’t. 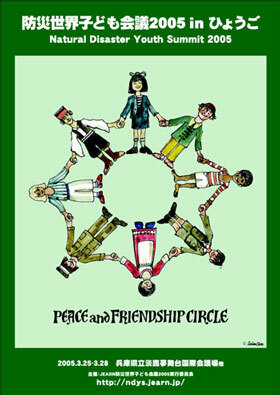 School is recognized as school which focuses on international exchange and disaster reduction by community. Participation of different students leads to participation of many students. Recognition community has is very important because theme of this project is that school is core facility of community.